As soon as we take off our Halloween masks, thoughts of goblins give way to thoughts of gobbling. Thanksgiving is the official kickoff to the holiday season and a great time to celebrate with family and friends. It even marks the start of Christmas-music season on the radio. But even Scrooge has to love Thanksgiving. It arrives before we have a chance to get stressed out over all the Christmas hype and the holiday season. 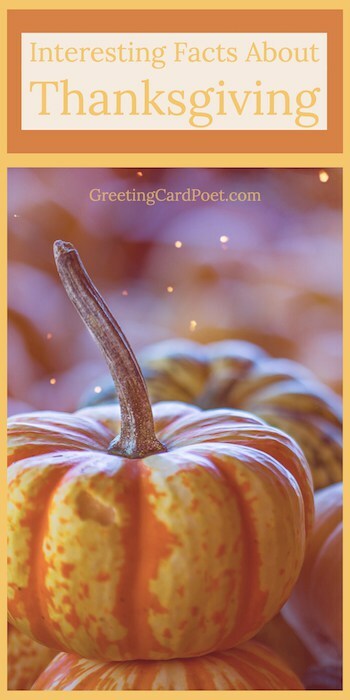 You don’t hear folks complaining about having to send out Thanksgiving cards, do you? And who can complain about a delicious Turkey Day feast? Who doesn’t love pumpkin pie? History books tell us our present-day Thanksgiving celebration traces its roots back to Plymouth, Massachusetts. It started in November of 1621, a year after the Pilgrims docked at Plymouth Rock. At that point, the 50-odd survivors of the 102 folks that had sailed on the Mayflower had a lot to be thankful for. First of all, they survived. Secondly, they managed to network successfully with some Native Americans who helped make the holiday native to the United States. In March of 1621, Samoset, a member of the Abenaki tribe, came into the Pilgrim’s camp. He spoke enough English to communicate — barely — with the Pilgrims. A few days later, he paid a return visit and brought along a friend who spoke better English. This was Squanto of the Pawtuxet tribe. Squanto’s background had included capture by an English sea captain, enslavement, and escape to London as a fugitive. But heroic Squanto apparently was not the type to carry a grudge. Showing the malnourished newcomers how to grow corn, catch fish, and draw sap from maple trees, he played a key role in enabling the colony to survive and prosper. Squanto also introduced the Pilgrims to the head honcho, Massasoit, chief of the Wampanoags. Thankful for a successful corn harvest, the Pilgrims originally planned to express their gratitude by praying and fasting. But after Massasoit buddied up to William Bradford, the Pilgrim’s Governor, these leaders planned a 3-day celebration — the fast became a feast. We don’t know if the participants actually referred to it as “Thanksgiving.” But the joint celebration heralded the start of a half-century of considerable harmony between the colonists and the Wampanoags. Check out these Turkey Day jokes. Everyone’s Thankful When Thanksgiving Comes Around – When was the First? Others maintain that neither Massachusetts nor Virginia hold the honor. Some contend that the first “Thanksgiving” services in what is now America date back to Spanish explorers in 1589 (San Elizario, Texas) or possibly even 1565 (St. Augustine, Florida). A happy heart is a thankful heart. Happy Thanksgiving! May the bounty of the season fill your heart and home – Happy Thanksgiving! Keep calm and gobble on – Happy Thanksgiving! May your heart be glad and your home be happy at this joyful time. After the Gobble Gobble comes the nap nap. Don’t forget to set your scale back 10 pounds tonight – Happy Thanksgiving. May your yams be delicious, your pies take the prize, and may your Turkey Day dinner stay off of your thighs. Although most Americans currently view the day as a secular holiday, its religious underpinnings are well-documented. When Governor Bradford held a second Plymouth celebration in 1623 to mark the end of a devastating drought, the event featured less feasting and more fasting than the 1621 celebration. Prayer services took place to seek forgiveness from what was perceived as punishment from God. The religious aspect of the holiday received additional emphasis from the Puritans, who first arrived in Boston in 1630. They “gave thanksgiving and praise to God’s providence” on days specially set aside for that purpose. The colonists’ desire to express thanks through prayer and celebration was ingrained in them, passed along from similar rituals practiced — in one form or another — for many centuries in the Old World. By the 1660s, New England communities were holding annual harvest festivals, with proclamations of thanks coming primarily from church leaders. During the revolutionary period, various governors also marked favorable events with thanksgiving ceremonies. New York became the first state to adopt an official, annual Thanksgiving holiday in 1817. Other states followed suit, but they each picked their own date of celebration. Sarah Josepha Hale, magazine editor and author, may be best known for writing “Mary Had a Little Lamb. But in 1827 she began campaigning to have the federal government recognize Thanksgiving as a national holiday. Each year she would publish an editorial promoting such legislation. For 36 years she also wrote letters — to governors, congressmen, and presidents. Her eventual success may be due to the Civil War. President Lincoln was looking for ways to ensure a continuing sense of unity and purpose among the Northern states. Sarah sent Lincoln her final letter on September 28, 1963. On October 3, he officially proclaimed the final Thursday in November as Thanksgiving Day in the hope that it would help “heal the wounds of the nation.” It was not until the 1870s, however, that the South came on board and Thanksgiving truly became a nationwide holiday — only the third national holiday, after Independence Day and Washington’s Birthday. There is always something to be thankful for. Happy Thanksgiving. 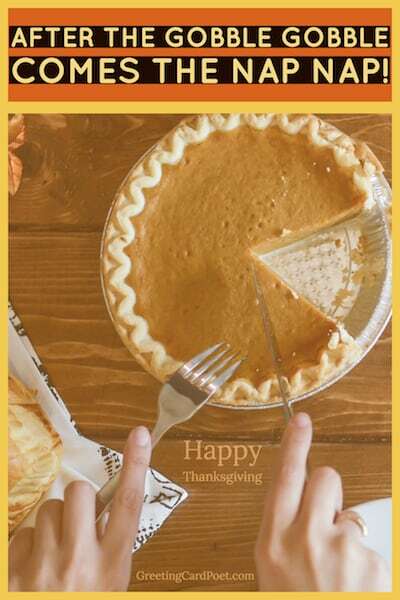 Gather together, give thanks, eat pie! Happy Thanksgiving! 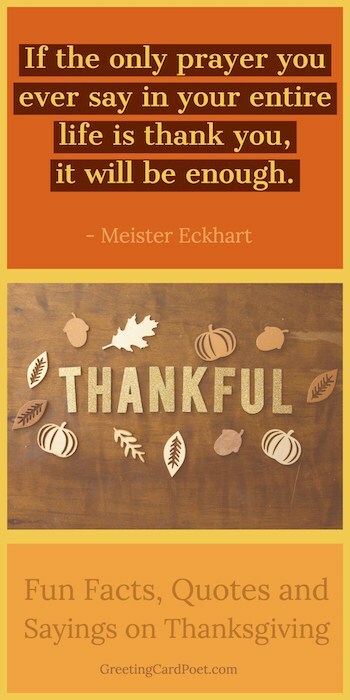 Check out some more Turkey Day quotes. The holiday remained the last Thursday in November until 1939. That’s when President Franklin Roosevelt decided to move the holiday up a week. The economy, still struggling to get out of the Great Depression, needed a boost. With the holiday a week earlier, Roosevelt figured Christmas shopping would also start a week earlier, boosting retail sales. America joked about the new holiday as “Franksgiving.” The switch was so unpopular that two years later Roosevelt changed it back — but not exactly. He compromised. Instead of the final Thursday in November, Thanksgiving would now be the fourth Thursday (not necessarily the final Thursday, since, some years, November has five Thursdays). Currently, the holiday still occurs on the fourth Thursday. For this year, the holiday will be celebrated on Thursday, November 22, 2018. Although Pilgrim chronicler Edward Winslow reported that — in preparation for the original 1621 celebration — Governor Bradford sent four men on a “fowling” mission, the fowl were most likely geese or ducks. Since the Wampanoag guests outnumbered the Pilgrims almost two to one, they did their share of the preparation. We know that they brought five deer with them. And historians believe Native American spices and cooking methods played a big part in meal preparation. Lobsters, oysters, eel, cod, and bass reportedly were on the table as well. It’s fun to imagine how participants ate these items. Their tables were set with only knives and spoons — forks hadn’t been invented yet! And eel doesn’t seem to fit the image of a finger food. 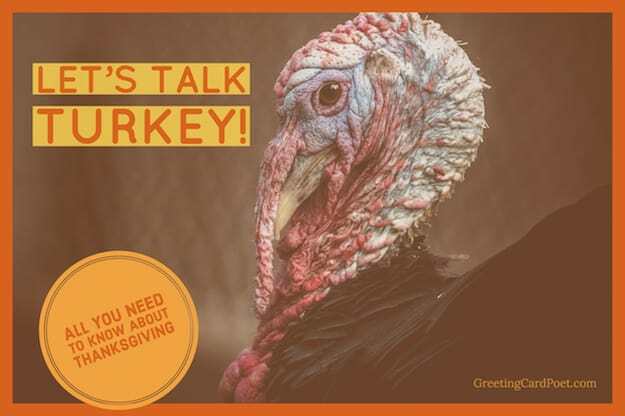 Turkey today plays such a key role in our tradition that the holiday is often referred to as “turkey day.” Even back in the 18th century, Ben Franklin called for the turkey, not the eagle, to be designated as the National Bird. In those days, the only turkeys in America were wild. Wild turkeys can fly and are able to run 20 miles an hour. Today’s domesticated turkeys are a different breed. Because the breast meat is the most popular part of the turkey, these birds have been bred to have large breasts. As a result, they not only are unable to fly but generally cannot even mate — the breast size blocks the male from mounting the female. Turkey producers usually rely on artificial insemination. Today, the average turkey weighs 15 pounds. The heaviest turkey on record tipped the scales at 86 pounds. 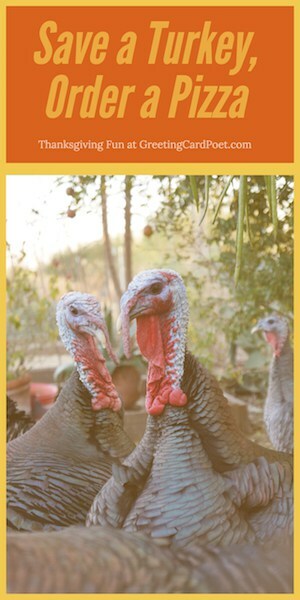 Consumers purchase about 280 million turkeys for each Thanksgiving, and 91% of Americans eat turkey on that day. Vegetarians can eat “turkey” made with tofu. In 1953, turkey helped bring about the invention of the frozen TV dinner! When a salesman learned that Swanson had 250 pounds of extra turkey on hand, he suggested they load it onto compartmentalized aluminum trays, along with a few other sides. And the rest is history. For most of us, Thanksgiving has become primarily secular rather than religious. It’s largely concerned with pleasing the palate — and not just with turkey. Besides working to make Thanksgiving official, Sarah Josepha Hale printed recipes featuring many of the foods that typically comprise the holiday meal: Sweet potatoes, mashed potatoes, gravy, stuffing, cranberry sauce, and pumpkin and apple pies. Campbell’s Soup created a green bean casserole recipe for Thanksgiving that became largely responsible for selling $20 million worth of cream of mushroom soup. Americans probably consume a fair amount of their Turkey Day bounty in front of their TVs. The Macy’s Thanksgiving Day parade is an annual tradition that attracts a huge TV audience, as well as two to three million spectators. Marching bands, celebrities atop enormous floats, and giant balloons representing famous cartoon characters are dramatic features of the parade today. But when it began in 1924 it consisted of real animals from Central Park Zoo and about 400 Macy’s employees. Of course, football fans can enjoy a tripleheader of televised NFL games running from early in the afternoon to late at night. But if you’d rather be a participant in sports rather than an observer, you can join one of the countless turkey trots — formal and informal — held coast to coast on or around Thanksgiving. These events are popular because they burn off calories before the big meal. Many of these footraces also raise money for various charities — the Silicon Valley Turkey Trot has raised nearly $8 million. In 1947, President Truman initiated an annual ceremony in which one lucky turkey receives a presidential pardon. After President Obama pardoned a 45-pound turkey named Courage, the bird went to California for appointment as Grand Marshal of Disneyland’s Thanksgiving Day parade. In most homes, the Turkey Day traditions are not as newsworthy as those emanating from the White House. But we all do what we can to make the day special. Some homes engage in the breaking of the wishbone. Two people make a wish and grab either side of the wishbone from the turkey’s chest. Folklore states that — when they split the bone — whoever ends up with the longer piece will have their wish granted. In my own family growing up, my dad literally scored a turkey in a bowling tournament. As his prize, he visited a turkey farm where he was able to pick out a turkey to bring home for the big day. As my dad told the story, “There were turkeys as far as the eye could see, but I spotted one head that stood high above all the others.” That’s the bird my dad selected. When he brought it home, my mom couldn’t fit it in the oven! You’re on our Happy Thanksgiving page.